Salmonella prevalence in eggs is a major concern to the egg industry. The results of new research on the subject were presented at the International Poultry Scientific Forum (IPSF) in Atlanta, Georgia, USA in January 2016. Martha Pulido-Landinez and Alejandro Banda, Mississippi State University, USA noted that Salmonella gallinarum (S. gallinarum- SG) is a cause of fowl typhoid, a severe disease of poultry, observed mainly in brown egg layers. Many predisposing and persistence factors have been evaluated in commercial flocks of some Latin American countries. SG has been isolated mainly from organs of sick birds, such as liver, spleen, bone marrow, and ovary follicles, and in some cases, Gallibacterium anatis (G. anatis) has been co-isolated from trachea, lungs, ovary follicles, and oviduct. In the houses affected by both agents, the mortality and drops in egg production have been more severe than in those flocks with no G. anatis isolation. Along with the traditional signs observed in fowl typhoid, there is more presence of respiratory problems in flocks affected with G. anatis. The sensitivity test results for both agents showed they are multiresistant, S. gallinarum being resistant to quinolones, fosfomicin and florfenicol, and susceptible to trim/sulfa, and tetraciclines. G. anatis showed susceptibility to fosfomicin and florfenicol and resistant to quinolones, trim/sulfa, and tetraciclines. The factors identified as common on affected farms include poor housing conditions with chicken houses very close each other (less than 15 metres), young hens (19-30 weeks of age) housed in proximity to old hens (older than 70 weeks of age), and the presence of cattle. When S. gallinarum is present on one farm, the multibacterial disease causes more severe clinical symptoms. G. anatis is often considered a normal inhabitant of the respiratory and reproductive tracts, however, this bacterium may contribute to the occurrence and persistence of S. gallinarum. Janet Gradl (graduate student) and Pat Curtis, Auburn University; Deana Jones, USDA Agricultural Research Service and Ken Anderson, North Carolina State University, USA, indicated that Salmonella enteritidis (SE) prevalence in eggs is a major concern to the egg industry. 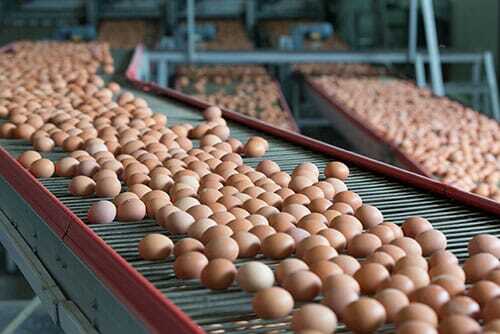 Some research has shown that egg sweating, which can occur when refrigerated eggs are moved to a warmer temperature, can increase Salmonella penetration into egg contents. This often occurs when eggs are allowed to temper before wash, to minimise thermal cracks from occurring. The objective of the study was to assess the effect of egg sweating on SE penetration into shell eggs over a six-week period stored at 4 °C. A 2x2 factorial of SE inoculation and egg sweating was utilized. Inoculated eggs were exposed to 108 SE. Sweated eggs were sweated for approximately 80 minutes in a 32° C incubator. Shell rinse, shell emulsion, and egg contents were enumerated and assessed for prevalence of SE throughout 6 weeks of 4 °C storage. In week 1, the shell rinse SE inoculated/non-sweated treatment had significantly higher Salmonella counts than the other three treatments, where no SE was detected. After week 1, no SE counts were obtained from the egg shell rinse, shell emulsion rinse, or egg contents. A significant week by treatment interaction was found. During weeks 1, 2, and 3 the shell rinse non-sweated and SE inoculated (SN) treatment had significantly higher SE prevalence than the sweated and inoculated treatment (SS). During weeks 4, 5, and 6, there was no difference in SE prevalence between the SS and SN treatment. Egg sweating did not increase SE penetration into the shell emulsion across treatment or week (P<0.05). The decreasing trend of SE prevalence obtained over the six-week period indicate that refrigeration is a very effective method to halt Salmonella growth. These results indicate that the current practice of egg sweating is not harmful to egg safety.